The 3rd and 4th of July in Split will be remembered for many things. Those were the days of joy, unity, the song of the heart – the days when Split threaded a garland of Love in its own way! The Split team, who were in charge of decorating the stage and the whole place, did an exquisite job: everything was overflowing in blue, violet and purple and it sparkled with the beauty of simplicity! For the whole time, musicians created a solemn and joyful atmosphere. Everything just flew like a river of joy with many hearts, who poured into the big heart, pulsating in the same rhythm, speaking in one, universal language – language of Love. On the first Darshan, Swamiji talked about the importance of dharma, the duty that is performed by every being during its life, but he accented the dharma above all dharmas – svadharma! "Svadharma means knowing who we are, knowing that we are divine love, that we are divine beings who have unique relationship with God, knowing it or not, liking it or not. This relationship is a relationship of love and it is eternal. This relationship is special in many ways, because regardless of whether we buildand develop this relationship or not from our side, God is always there and He never breaks His relationship with each individual soul. His Love is Unconditional, loyal and patient. Swamiji afterwards said that loving others is generally easy, but there is often a problem with loving ourselves, accepting ourselves unconditionally for who we are and seeing ourselves the way that God sees us. "More love that we have for ourselves will make more love for others too, because better understanding we have about ourselves, means better understanding for the other. Swamiji gave a beautiful analogy of how love is powerful because it brings us up to the seventh heaven from where, of course, everything looks perfect, harmonious and beautiful. Only love gives such a perspective, and such love is in the heart of every being. All we need is to awaken it through developing our personal relationship with the Divine, with God." Then Swami told the story of Krishna leela - the story of Sudama, Krishna's childhood friend and friendly love they had and shared. He spoke of the sublime purity of friendship that Sudama had for Krishna and although in the past he made a mistake, it never diminished his love for Krishna or Krishna's love for him. Indeed, the story unfolds pure, unmotivated love for God which is so powerful that God himself is running to meet such a devotee, hugging him, personally serves him and above all take care of the welfare of his devotees at all levels. Ultimately God gives Himself to such a devotee. There was a special surprise before the Darshan - an ancient Indian dance - which was not only a dance but a story told through movement, facial expression and emotions. Thanks to dear Devi Rani we all were a part of this magical journey. The second day of Darshan was held in the same joyful mood. It was a great feeling sharing the joy with others, and therefore we hope that the next time there will be even more souls gathered in the joyful atmosphere of love. The only way for the global changes to occur is when each one of us know that this change begins with us, with each of us and with sharing more and more love with others. Swami has also pointed out that if we do not show that love to each other, if we do not share it, it will be hard to believe that it exists. Especially in this time of the various challenges. Therefore, the more we express love, more and deeper we get to know its infinite and endless nature and the truth that we are this Love. Thank you Swami, thank you Bhakti Marga family and thanks to everybody who helped with this festival of Love. We hope to see you soon in the near future. SSV: It's not about that beauty, you know? What makes it more beautiful is the bouquet of flowers, all together. When all of you are together it's much more beautiful than one. That's what I was saying yesterday to Kalavati: You see, with one flower you can't make a garland. You need lots of flowers to make a beautiful garland. And these flowers are all of you, you know. If you want to make a beautiful mala it needs all of you working together, threading yourself and make beautiful mala for God. He was like Divine Mother. He showered us with his beautiful smile and open heart. Swami Vishwananda gave something to everybody, but when we put all this together, we see that he actually created a garland out of our souls - beautiful garland of different personalities that are aiming towards unity. Big sadness and feeling of loneliness were arising these days in me. Guruji comforted me by saying,"You know, everybody can leave you, but God never will. He is always with you." By saying this he removed my sadness and reminded me about Absolute truth and showed me the way towards unity with myself - and by that with God and everybody else. Swamiji again showed us how loving, beautiful and unpredictable he is. For the time of wedding ceremony, each moment we felt more and more love, happiness, fulfillment and connection to the Divine. This was ceremony of connecting the two souls. But in the end, as a surprise, Guruji gave us rings from Giridhari. This was beautiful gesture that showed us that in the end, Giridhari is the One to whom we got married, as He is the only true Love of each soul. He is the One who connects all, writes down each 'love story' and plays His Divine leela through each and every soul. Later on many of our wedding guests told us, that they also felt strongly like it was more a wedding ceremony of a soul to its Eternal Beloved, rather than to another soul. Such is his Divine game. These were truly magical moments that will stay in our hearts forever. So, completely overhearing me saying the latest magnificent news to him, Guruji asked, "So are you gonna recite it this evening?" My mind started panicking - I do not know how to do it, never have I even tried... especially not in a Darshan, especially not the whole song all at once! At that moment I suggested that Pramod does it, but Gurudev just rolled his eyes and changed the topic. 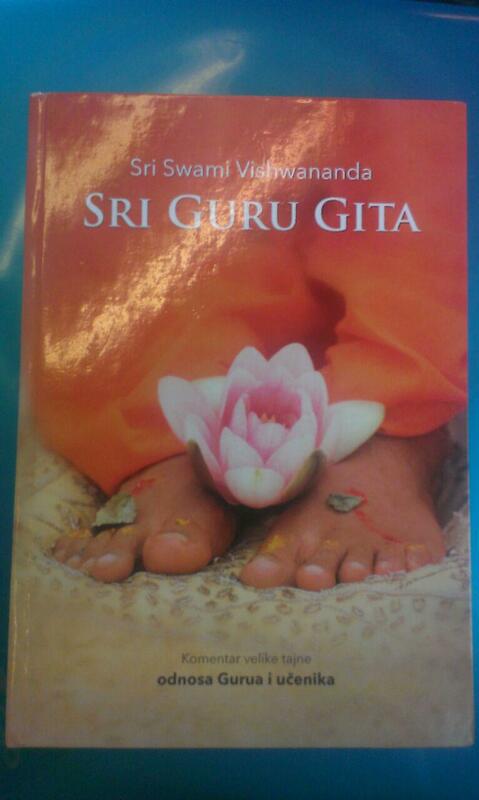 Nevertheless, I had to obey my Guru, right? Anyways, 4 of us have together recited the Sri Guru Gita that evening during Darshan. It was magical! And he proved to me that everything is possible, especially when he gives a task. Also, quite a few copies of the book were sold. For me this whole trip was a living proof of how beautifully all of us can serve both him and each other, regardless of all the hindrances, challenges or differences. Thank you, everyone. Thank you, Guruji. Hari bol!